When folks go out for a Korean meal, they usually expect an open grill with a hearty serving of marinated meats and sizzling stone pot rice dishes in a room filled with seared aromas. 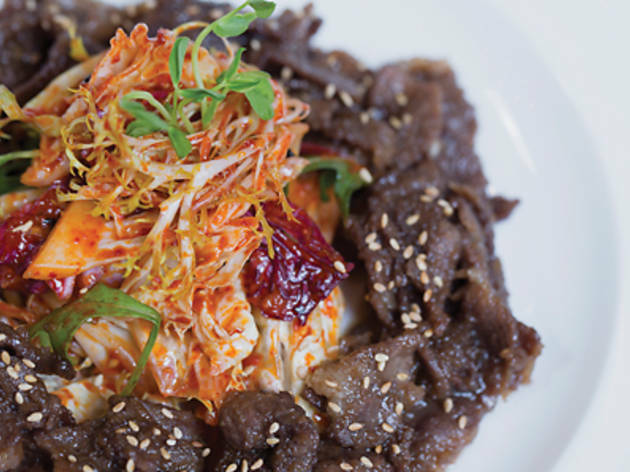 So when you hear ‘modern’ and ‘refined’ used to describe new Korean restaurant Sanche, don’t shy away or you’ll miss out on a delectable fare of reinterpreted Korean favourites served in an open and comfortably minimalist space without a grill in sight. We start our meal with a meticulously plated beef salad ($128), which is basically a serving of bulgogi (grilled marinated beef) over fresh greens. The well-textured and well-seasoned dish blends sweet and savoury harmoniously, teasing the palate with its flavours. 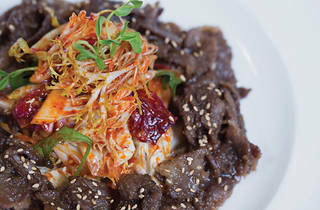 Other highlights include the crispy mung bean kimchi pancake ($108), which is hearty, and the spicy pork belly barbecue ($108), which comes with a healthy heap of excellent homemade pickled kimchi. A potential downside to Sanche is that it doesn’t serve banchans (small dishes) with the main dishes – however, with the overall elevated quality of the food, it doesn’t really matter. Sanche Shop C, 32 Gage St, Central, 2628 3248; sanchehk.com. Dinner for two: $600.